Why giving a website as gift is good idea? Finding the right gift for somebody is always a hard task. Of course you can take the safe route and just go for chocolates and flowers for the ladies or tickets to a home game for the guys. But where’s the fun in that? You have to think two things when choosing a gift. First, the other person should appreciate it. You can’t give a baseball bat to a girlfriend who knows nothing about baseball because that is just plain weird. Secondly, it should serve a purpose. The purpose can be as simple as making that other person happy or it can serve a larger purpose in his/her life. The choice is yours. That’s the reason why we spend hours after hours thinking of the perfect gift for another person. But it seems like one option is overlooked more often than not. Most of us think that brands or businesses are the only ones who should have websites. I mean, they are there so people can look them up, right? Plus, they must cost a fortune to set up not to mention the other stuff you need to pay to make them look good. Having a personal website seems a bit unnecessary if you ask a regular bloke. Have you ever thought of giving somebody a website as a gift? Think about it. It is the perfect gift for anybody. It doesn’t matter if the recipient is the CEO of a company or a roommate who has a knack for the arts. Everybody deserves a website of their own. They can use them for their business. Not all businesses have their own websites because some business owners think that setting one up and managing it is a total waste of resources and time. If the recipient is a business owner, go the extra mile and give him/her a short lesson on why they need a website. Remember that a good website is needed if you want to survive in this digital world. Professionals can use a personal website as a contact page. If you’ve lived in the 90’s then you can remember flyers or ad pamphlets given by local service people telling you that you can call them if you need something done. Why don’t you take this to the next level and use a personal website to announce to the world what the recipient does. He/She can be a painter, writer, plumber, astronaut, or physicist but the purpose of the personal website stays the same, to advertise a person’s expertise. So if you think your recipient is a great professional and more people should recognize them then a personal website is a good option. It can be an avenue for expression. A personal website does not have to be all about what you do and how good you are at it. It can also be about what you think and feel. A lot of people use their personal websites as blogs. A blog is a website that contains various entries that may or may not revolve around a certain topic. If you think the recipient is the kind of person who has a story to tell or who can share his/her feelings and opinions freely, a personal website is indeed a good option. Giving away a website as a gift is not only ingenious but also quite thoughtful. It is the perfect gift for the very digital-centric world. A website usually won’t cost you much. You can set up a website for 1 year for under $60. With new technologies surfacing every day, managing one is easier than ever. Still, you might want to think about giving the recipient a crash course on the Internet. It is known that most businessmen and professionals don’t have their own websites because they don’t know how it works. So how about this, instead of just giving a website? ?add in a short tutorial on what it does and how it helps them. This will ensure that your recipient will see the real beauty behind your gift. 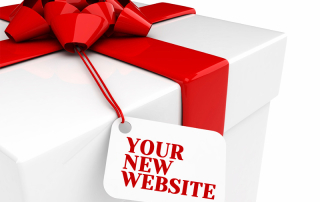 Learn how to and gift a website now. It might just be what your friend/ parent/ sibling/ lover needs.